Q-nomy’s appointment scheduling software for banking helps to increase customer satisfaction and agent sales output in banks, credit unions and CFI’s. It optimizes the omni-channel customer appointment booking experience by managing appointment scheduling from self-service online and mobile apps, as well as from contact center and branch agents. Like all Q-nomy’s solutions, our Appointment Scheduling Solution can be either cloud based or installed on premise. It is scalable to any number of branches, agents and customers. Q-nomy’s appointment scheduling solution is part of Q-nomy’s Customer Experience Optimization Solution for banks and retail financial institutions. It can be easily integrated with Q-nomy’s market-leading customer visit management and video interaction management solutions. Increases customer satisfaction and experience through easy-to-use self-service scheduling that matches agent availability and skills with required service type. Ensures consistency in the matching of customers and requests to specific agents, in the messages conveyed to customers prior their arrival to an appointment, and in the preparation of agents for their appointments. Adds value when debranching is considered and when branches need to boost performance and reduce cost of sale. The central server can be scaled up from a single point-of-service to any number of branches, across borders and continents. Integrates with CRM systems to maximize benefit to customer and improve agent sales output. Can be implemented as Q-nomy's Visit Management App that offers mobile users the option to schedule and check in for appointments, locate branches, and displays queue information in addition to other functions. Branch agent interface for scheduling appointments and reviewing appointments scheduled for the branch through other channels. Agent can see customer CRM data integrated in the application’s interface when scheduling. 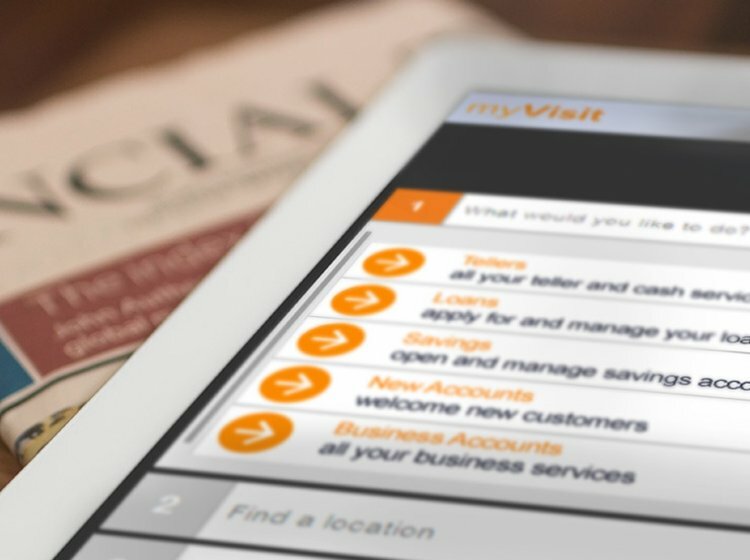 In-branch greeter can view walk-in customer CRM data in iPad or kiosk and schedule a meeting for them (and route customers accordingly when using Q-nomy’s visit management solution). Call center agent interface for enterprise-wide scheduling based on customer requests. Video interaction management for scheduling and performing video calls, using the same business logic used to assign walk-in customer appointments to agents. Web interface – customizable self-service Web interface that allows online appointment scheduling by customers, using the enterprise website or a Q‑nomy hosted Web server, which can be integrated into your website's store locator and online ad campaigns. Automated reminders – sends customer reminders, including appointment details, promotional messages, preparation instructions, a link for cancellations/re-scheduling/other. These reminders can be printed when scheduling the appointment, or emailed/sent as an SMS afterwards/a few hours before the appointment. All configuration settings are parameter-based, require no programming, are done via remote secured Web connection and affect all branches immediately.